The leaves are officially falling all over the place now! The other day I was making homemade tortillas and as I rolled out the dough, it occured to me that I could cut them out into fall shapes before cooking them. So I dug out my maple leaf cookie cutter and proceeded to do just that. Pierce had two homemade tortillas topped with refried beans, melted cheese, and of course olives (the boy is crazy for olives!). 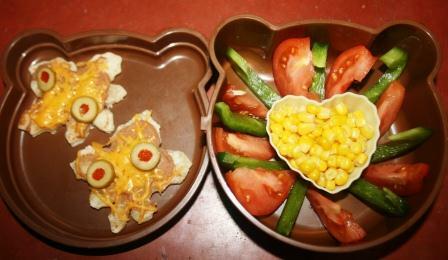 He also had a heart muffin cup with corn, and sliced tomatoes and green peppers from the garden. My garden was pitiful this year, but I did get a few tomatoes and green peppers at least. Pierce ate everything but a few bites of the corn. Those tortillas with the refried beans sound very good. Not so sure about the green olives on top though. Cute container. JDaniel loves olives too. This lunch is filled with such delicious foods. You are making me hugry for mexican!! I used to make tortillas but it has been years since I made them. You are so creative, Lisa... and I love olives too! What a cute idea! Now I'm hungry. What another creative idea Lisa. Olives are my favorite.I can eat them by the jar! They really look like leaves! The whole lunch looks colorful and delicious (and healthy!). Another cute inspiration. We just picked all of our peppers off the vines for the season. I'll have to come up with some pepper creativity myself this week! I'm with Pierce! I love me some olives. Hubby can't stand them and I'm glad because that's more for me! Cute idea! Now I'm craving refried beans haha. Great idea with the maple leaf cutters. My husband loves olives, too. Since he can't have sweets, sometimes for birthdays,he gets a special collection of olives! That's great he's open minded enough for Olives. My kids won't eat them. Once I played a joke on Mica. I put two black olives in a pile of purple/black grapes. He took a bite out of them and his happy face turned into a yucky look. It was so funny. He said, "Mom something is wrong with these grapes!" Of course you would think to cut the tortillas into shapes....lol. You simply amaze me! Just so cute! Gives me ideas for my grandkidgirls. I got to see them last night and they are super! I always get to see my grandson. He was there last night too and I had to share him with them because they only see him once a month or so. (my youngest daughter - mom to baby boy-) live 15 minutes away. My other grands live about one hour and 15 minutes away. I'm so grateful I know them all. An autumnal lunch fit for a Prince! What a great idea. I wish I could be so creative with my grandchildrens lunches. I hope you have a great week. How creative Lisa...I love olives too! That lucky little guy to get this spread placed before him...so cute and healthful. I like the leaves! Cute idea! that might be cute for fall parties too...crispy leaf tortillas and dip. YUM! Love the leaves! They look yummy! Yum! Homemade tortillas are the best! I love that you cut the tortillas into maple leaves! Your creativity knows no bounds. A* for these.